The Auvergne Region of France offers exceptional variety of properties for rent, whether you want a relaxing holiday to unwind or an activities based holiday then the Auvergne is truly the place to find what you are looking for. Every conceivable outdoor activity is catered for and nearby you will find suitable holiday accommodation. This Region is blessed with two holiday seasons the summer for hiking, watersports and general sight seeing and the winter for skiiing and mountain treking, not to mention the unspoilt medieval towns and villages. 2 Bedrooms, Sleeps 6-7, Changeover Saturdays. 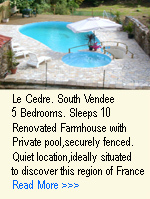 3 Gites with swimming pool in Massif Central. Prices from £325 to £450pw. Prises from: 269euros to 769euros. 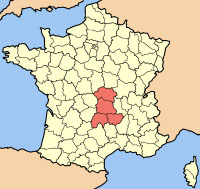 Situated in the middle of the Volcans d'Auvergne. Prices from: £290 to £590.pw.